The intimate Madeline Room, on the second floor and at the back of the house, has antique maple furniture with a double bed and desk and the original wide pine floors. 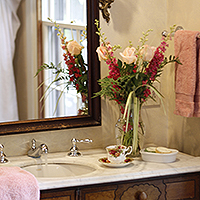 The shower/bathroom opens from the cozy room through an inviting archway with sheer curtains to reveal an antique vanity dresser with the original marble top from the house’s first bathroom and a custom dual marble shower. Just wanted to say how much we enjoyed your great b&b. With the piano, all the art works… it was like walking into a grand home maybe a century ago. And I must admit I don’t normally get treated to such super breakfasts – the French toast was a rare treat. The conversation was the jam on the scones.